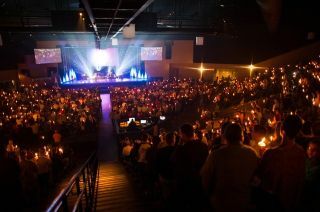 Christmas Eve Production at Crossroads Church, Corona, CA. Photos by Pam Booher. Crossroads Church, a 121-year old congregation located in Corona, CA, recently upgraded its sound reinforcement system with the addition of 24 PowerLight 3 Series PL380 amplifiers and two Q-Sys I/O Frames — all controlled by a Q-Sys Core 500i Integrated Core. The upgrade was designed to support the congregations’ impassioned contemporary services that can boast weekend attendances of nearly 8,000 worshipers. Sidoti spent several weeks learning and understanding software downloaded from various manufacturers’ websites to determine the best solution for Crossroads Church. After watching all the Q-Sys videos at qsctraining.com and downloading the Q-Sys Designer software, he decided to go with the QSC solution. According to Sidoti, he went live with the new system just before Thanksgiving, on November 17 and was fully up and running on November 20, just in time for Crossroads to begin rehearsals on the 25th of November for their Christmas show.